As Web sites have gotten more and more complex, many Web pages have become more and more difficult to read. Type is smaller, page layouts are getting more cluttered, and ads and other objects are breaking the flow of text. So I’m a big fan of programs and services that make the Web more readable. Which leads me to today’s Gem, Readability, which, unlike most Gems, isn’t a program you download to your Mac, but rather an online service. Call it—with apologies to ESPN—a Web Gem. Readability, a project of the Arc90 Lab, is a bookmarklet-based browser tool that reformats a Web page and presents the page’s text content in a plain, easy-to-read format. Inspired by Instapaper, the save-it-for-later-reading Web service, Readability lets you make almost any page more readable with a single click—or even a keyboard shortcut (see below). To set up Readability, first you go to the Readability Web page and choose your settings—you get four choices each for layout style, font size, and margin width; a live preview shows each setting in action. (My personal choices are Novel style, Large text, and Medium margins.) Then you drag the Readability bookmark from the right-hand side of the Web page into the Bookmarks Bar in your Web browser. That’s all there is to it. Want to get the original page back? Click your browser’s refresh button and the page is restored to its original appearance—you don’t have to use the Back button or worry about losing the URL. You can also print the “readable” version of the page, or e-mail the original URL, via toolbar buttons to the left. The developers of Readability don’t list browser compatibility, noting only that it works with “most major modern browsers.” In my testing, it works well with the current versions of Safari and Firefox, though it does have a few limitations. First, it occasionally incorrectly identifies bits of article text as non-article content, leading that content to be omitted from the reformatted page; it also sometimes removes images that are part of the article. Second, when multiple blog entries are open in my browser from a single site, invoking Readability occasionally loads the text of an article in a different tab. Finally, some sites, because of the way they’re coded, just don’t work well with Readability. The good news is that Readability is so quick and easy to use, and so often effective, that in the cases where it doesn’t work properly, a simple Refresh command brings back the original page. 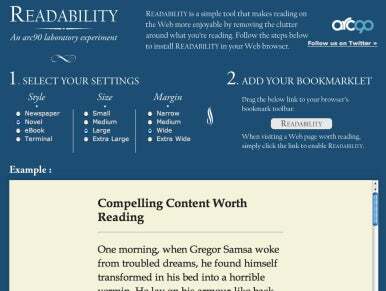 I find myself using Readability many times each day to make my Web reading more enjoyable.